early residents and businessmen. The house was restored to its original style in 1979. Tap image for more information . 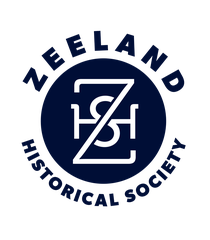 . .
Zeeland soon will have a museum on Main St., a combination 1876 home and store which will be restored to 1876-1900 styles by the Zeeland Historical Society founded a year ago. 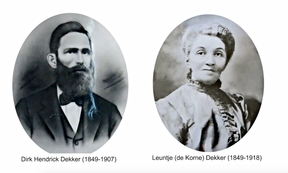 The museum will be known as Dekker Huis and Zeeland Historical Museum after Dirk and Leuntje Dekker who came to Zeeland in 1876 from Grand Rapids. They had originally come from Goes, Zeeland, in the Netherlands, where they had been jewelers, and they brought their skills to the small colony of Zeeland. Local Veneklasen brick was used in the brick portions of the home and store back in 1876. The store became a grocery featuring imported items among its stock. When Dirk died, Leuntje operated the business, proving herself a competent merchant while raising 12 children.